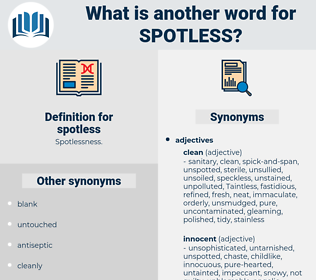 What is another word for spotless? flawed, stained, dirty, soiled, imperfect. smirched, greasy, defiled, polluted, uncleaned, unsterile, unsterilized, unwashed, spotted, discolored, germy. begrime, bemire, colly, contaminating, grime, impure, soil. In summer the red roses, in autumn the bright apples on the tree, reminded him of her; in the spring he thought of her youth and beauty joyously surrendered to Christ, and the snow in winter spoke to him of her spotless innocence. His hands were now spotless, and his whole appearance agreeably clean and wholesome. shaft louse, shop talk, spade-like, safety lock, subtilise, subtilize, shiftless.